Errol: Wow, I haven’t had Brian on for a while. He’s the one that runs our server and comments periodically! ^_^ He also helped out Ja-Mez with 3 Geeks in a Pod’s website. He’s awesome! Debs: Wiki’s up, thank you Brian! Brian: Hey! It’s ME! This conversation was a strange one. Mostly because every time I say Hi! to Errol in chat, I’m instantly in a group chat with a half dozen other people and that didn’t happen this time. That poor little chat window sat there all by its lonesome. Brian is awesome and doesn’t get enough credit! You know what I’d like to see: a chart! A chart with ALL D&E characters. I giant sprawling chart with arrows and information and correlative data. Oh, like one of those relationships flow charts? That would be kind of cool. In the mean time, all we have are a few comic bios that really need to be updated. 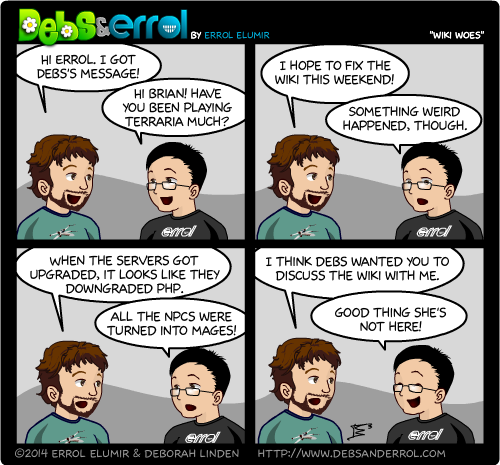 I love how even in the comic notes, Debs is on topic and Errol isn’t. It’s like you guys really are your characters! Comic Debs likes you, moffattbooks – you usually take her side! 🙂 But it’s okay if you don’t sometimes! My kids are totally tickled that they made a comic happen! C: OH!!! Does he mean Wizards? Me: Yeah, did you do that? J: YOU MADE THAT COMIC HAPPEN!!!!!! Much smiling an laughing and then C’s eyes got big as he pictured an upset Errol. C: But I only spawned one! I didn’t do it!